Yay, back with another lip post – my favourite type of beauty content. 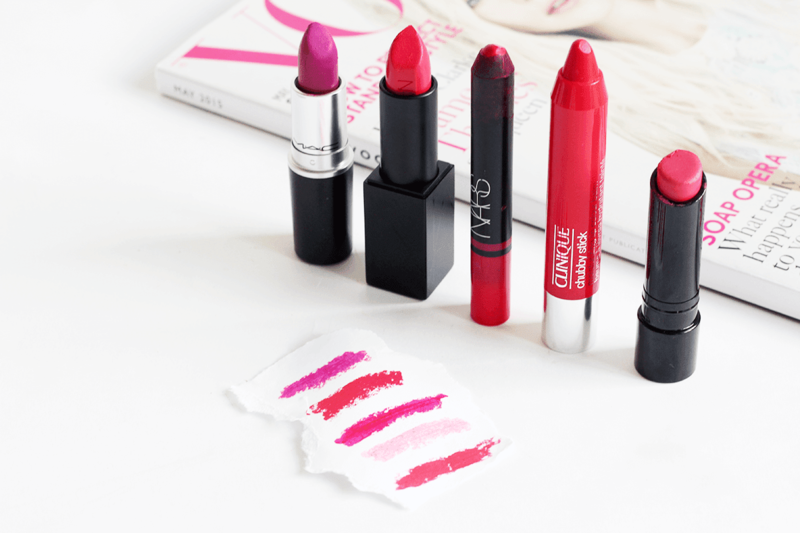 I do worry I’m a bit obsessed with lipsticks sometimes, as it’s the first section I check when I go online shopping or am at a beauty counter, does anyone else do that? As it’s feeling all like Spring outside with the warm weather, I’m been wearing the crap outta some bright lip shades because why not? Starting with the top swatch, for days I’m feeling particularly bold, I’ll go for MAC Matte Lipstick in Flat Out Fabulous. Not entirely for the fainthearted, the bright pink-with-a-hint-of-violet shade has a serious colour pay off with it being a matte, but looks so nice on the lips. It’s a great one to have in your collection! Next is NARS Audacious Lipstick in Grace, which is a mix between a bright coral and a bright raspberry tone. It’s one of those shades that looks great with a tan, so I know I’ll be wearing it all summer long, plus the audacious line has to be one of my all time favourites for consistency and range of colours. 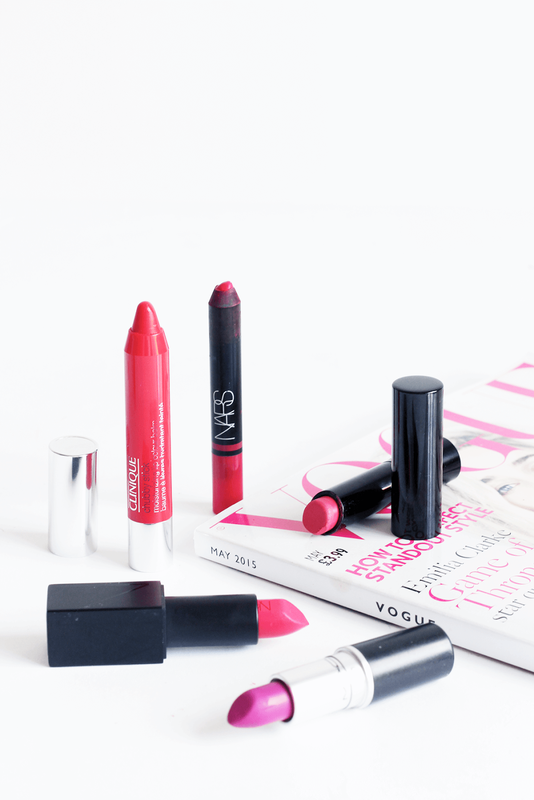 Another NARS offering and this time it’s NARS Satin Lip Pencil in Luxembourg. The hot pink shade is one I often reach for when I want a bold pink lip, as I know it stays around for quite a few hours and the pencil means it’s super easy to throw on and go. It’s a really flattering shade, too. Now, this looks more bold in the tube than it does swatched, so I’ll refer to this as the ‘subtle bold’ shade. Clinique Chubby Stick in Two Ton Tomato is a gorgeous red that offers a dose of hydration along with a wash of red. So, while you’re not getting a super opaque swipe of colour, you’ll get a slick of red that can look just as impactful if your makeup is subtle everywhere else! Finally, the Bobbi Brown Creamy Matte Lip Colour in Calypso is one I’ve had in my collection for a while and I keep going back to it. It’s a very pretty watermelon sort of shade, so a mix between orange pink and red, and makes for a perfect summer shade. The matte finish means it lasts ages on the lips too! What are your favourite shades right now? Make sure you enter my USA beauty giveaway to win a Lorac Pro palette and more!